Blacklists are the most challenging issue for email marketers. You may follow best email marketing practices compliant with CAN-SPAM law and still end up in a blacklist. The worst thing is that you will not even know that you are blacklisted until you take some steps to investigate the issue. So, in this article we’ll talk about the causes why you may get into a blacklist, examine the ways how you can determine if you’ve been blacklisted or not, and give several tips what to do if you got blacklisted. Corporate blacklists (a server administrator in an organization can create an “internal” blacklist and use it to block emails originating from any sender or organization for any reason and for any period of time). 1. Spam Complaints from Email Recipients. Most of complaints are generated when a recipient hits the “This is Spam” button on an email. It is recognized that even 100% permission based email lists can entail spam complaints. The recipients may report the email as spam intentionally (because they believe the email is spam) or unintentionally (by clicking on the “This is Spam” button instead of deleting the email by accident). Some email recipients do not trust the unsubscribe option. They prefer reporting the email as spam in order not to receive emails from this sender anymore. Whatever the reason is, the ISP still counts a spam complaint. What ISPs and blacklists are watching is the high complaint rate which betrays spammers and sometimes good email marketers who are not following best email marketing practices. 2. Poor List Hygiene: Sending to Bad and Spam Trap Email Addresses. A certain number of bounced emails after each email campaign is normal. But if your bounce rate is higher than acceptable, you are a candidate for a blacklist. But the bigger threat is behind spam trap email accounts. Some ISPs turn abandoned email addresses into spam trap mailboxes. It’s assumed that no one will send emails at those addresses. Any message sent to a spam trap address is treated as spam. Continuous emailing at spam trap accounts is one more step to get blacklisted. Most of the time spam trap email addresses are met in old and harvested email lists. If you take a list that you have not emailed to for a year or two, it’s likely to contain many invalid and spam trap emails just like a list that you would collect on the Internet. 3. Bad Server and IP Reputation. If you don’t have your own SMTP server and send emails from a shared mail server, your reputation depends on that server reputation. If a sender also using that server is blacklisted, you will also be. Sometimes ISPs blacklist the entire IP ranges. 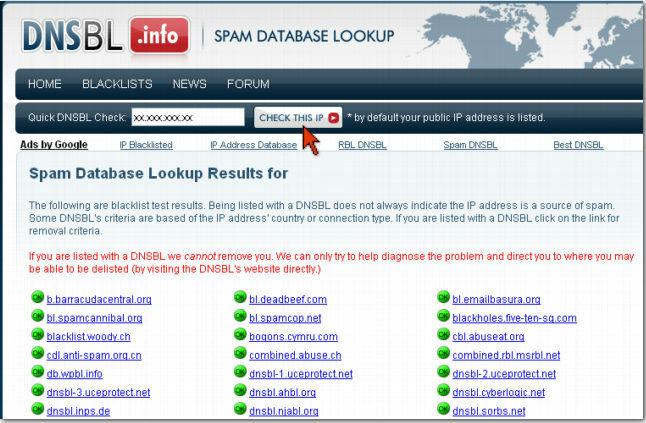 If an IP address from your IP block is suspected in spam activity, your IP may become blacklisted as well. It’s difficult to diagnose this situation because the permutation of IP address number combinations is almost infinite. As you see being put on a blacklisted is not necessary the result of a spam-like sending activity. The mail server you use may become a victim of a bot or other technical problem. When you are put on a blacklist, you are not notified about it. Most of the time your emails are deleted and either you or recipient know about it. And since a blacklist can be maintained by anyone, it’s impossible to identify every blacklist where you may be listed on. In addition, ISP and email clients’ blacklists are private so you can’t check up your blacklisting status with them. 1. Check Your Opens/Clicks by Domain. If you notice a decline in your overall open and click rates, it may be because you were put on a blacklist. You’ll want to examine your email tracking statistics for the key domains as a part of your regular audit. A blacklisting effect may not be visible on your overall stats if the portion of key domains in your list is small relative to the size of the whole list, but blacklisting problems will be clearly noticeable if you analyze opens and clicks at the domain level. Setup an account on G-Lock Email Analytics email tracking service if you don’t have it yet and start tracking opens and clicks for your email campaigns right away in order to diagnose possible blacklisting issues as soon as possible. 2. Monitor Complaints from Your Recipients about Not Receiving Emails. Your most faithful subscribers will let you know if suddenly they stop receiving your emails. Be sure that your customer service does not ignore such complaints and alerts you immediately if someone tells they’re missing your newsletters. 3. Use Blacklist Research Tools. You can use the G-Lock Apps delivery and spam testing tools to see your inbox placement, spam scores, authentication issues, daily blacklist monitoring to check if your server’s IP address is blacklisted and get summary email alerts if any problems are detected. – Spamcop: click on Blocking List tab at their website, type your IP address and SpamCop will tell you if you are listed on its blacklist. – Spam Database Lookup: just go to their website and click on the “Check This IP” button (they detect your public IP address automatically). 4. Check Your Company’s Email System for Security Gaps. If you’re not using an ESP (email service provider) and sending emails directly from your company, spammers may use “botnets” to breach your security, access your mail servers and use them to send spam. This is when a group of computers is infected and commanded by outside software and the servers are programmed to perform other services without your company’s knowledge. Be sure your IT department is aware of possible security gaps and consider using an ESP. So what do you do if despite all precautions you’ve been blacklisted? First of all, try to find out if your IP address appears on a specific blacklist, or on an ISP blacklist. If you’re listed in an individual blacklist, don’t take it close to heart. But if you discover that your emails sent to a specific domain are not getting opened, your IP is most likely on a blacklist of the specific ISP and this case needs your attention. If you’re using an ESP, contact them. Many ESPs are in good relationships with ISPs and major blacklists. If the ESP has a good reputation and allow only opt-in email marketers use their services, then the blacklist may take your IP off. If you’re not using an ESP and send emails from a dedicated server, you’ll need to contact the ISP you’re blacklisted with yourself and go through the removal process. But before you do it, try to identify the cause why you were blacklisted and eliminate the problem. Most of public blacklists usually publish the rules based on which senders are put on a blacklist. If you get familiar with those rules, it will help you better understand what you did wrong. If you do not take this step, it may have a negative impact on your relationship with the blacklist providers and make it harder to be removed from the list in the future. After you eliminated a possible cause of being blacklisted, go to the ISP website and search for the removal procedure rules. Each blacklist has its own procedure for requesting removal, so you’ll have to follow different instructions if you were blacklisted in several blacklists. Be ready to provide the proves that you follow email best practices, i.e. use a valid and verified opt-in list, clean HTML code, etc. If you’re not using an ESP, make sure with your IT department that your servers haven’t been breached. If you market certain products or services (luxury watches, medications, weight loss related products, etc.) which are often met in spam emails, you’re sentenced to be blacklisted and/or filtered. This makes it more important that you respect best email marketing practices, especially sender authentication aspect, and that you have a proof you’re a permission-based email marketer. For example, when you collect opt-in subscribers, be sure to document the opt-in offer text, date and source of opt-in besides the actual opt-in information. Consider using a confirmed opt-in method instead of a single opt-in to reinforce your status of a good email marketer. And the final question you are probably asking yourself is how you can permanently protect yourself against being blacklisted. The answer is simple – you can’t. Your sender reputation and authentication, opt-in list, whitelisting, and email best practices compliance only reduce the risk of being blacklisted but do not exclude it. They may help avoid being added to an ISP blacklist but they do not guarantee you won’t appear in an individual blacklist. So, follow best practices and, as part of your regular email system auditing, take time to put blacklist detection methods we recommended into practice. I never heard of spam trap email addresses. If that’s true, then do you think it is a good idea to keep cleaning your list of the subscribers who have not opened any e-mail for a long time? If someone hasn’t opened even single one of my e-mail for several months, it can be either because I am on their personal blacklist or it is a spam trap email addresses, so in either case I think it will be best to remove them from the list.Is there a way to routinely clean up your list just to make sure you are not sending mails to spam trap email addresses? I’m aware that many ISPs use spam blacklist checking tool to quickly see if networks are blocked. This is a useful place to check to see whether your email range is being blocked, and thus potentially proventing your email marketing getting through.